Detectives are investigating a report of sexual assault in Derry during the early hours of Sunday, November 18. PSNI Detective Constable Suzanne Nicol said the woman in her late 20s was approached and sexually assaulted by an unknown male in the Great James Street area shortly before 2am. She said: “The suspect is described as having a shaved head and was wearing a grey hoody with dark tracksuit bottoms. “It’s believed he was driving a dark-coloured, people carrier-style vehicle. Detectives are also keen to hear from anyone who may have captured dashcam footage. 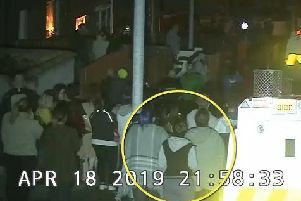 Detectives can be contacted by calling 101, quoting reference number 241 of 18/11/18.